UPDATE: POLICE say the father who shot and killed his two teenage children, and was later found dead at his home in a neighbouring suburb, carried out a "premeditated and planned" attack. The teens' mother arrived to her home in the northwestern Sydney suburb of West Pennant Hills yesterday afternoon to find her son, 15, and daughter, 13, murdered in their bedrooms. The couple had been separated for more than two years and there had been a dispute over the custody of the children. Police at the scene where a teenage girl and boy were shot in their bedrooms in a suburban home in West Pennant Hills. Picture: Dan Himbrechts. 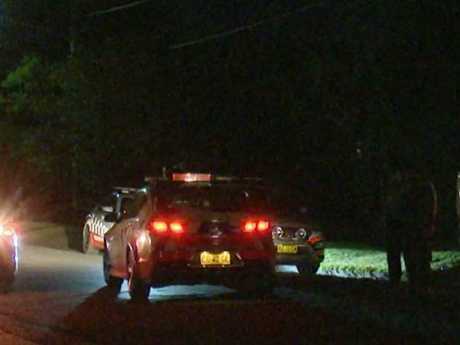 Police were hunting for that dad last night however, this morning, NSW Police confirmed that officers found the 68-year-old suspect dead at his home in Normanhurst, just a few kilometres from the West Pennant Hills address. Acting Assistant Commissioner Brett McFadden told reporters the couple had been in a long-term relationship. 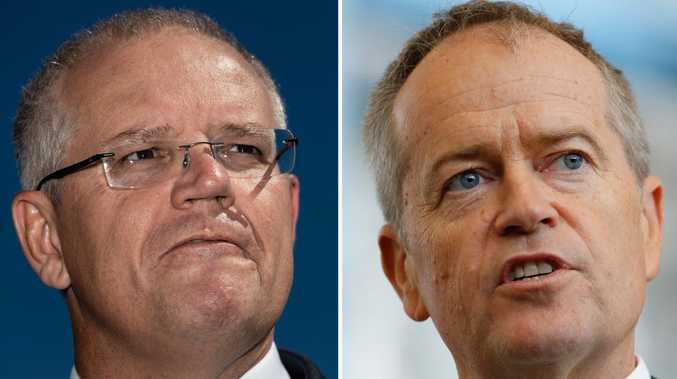 However, this had broken down in recent years and he lived separately from the rest of the family at the Normanhurst address where he was discovered dead this morning. Police say the dad went to the West Pennant Hills address yesterday, where the mother and two children lived, to carry out the "targeted incident" related to domestic violence. Police say there were custody hearings over the children during the past two years. The father had a criminal record, however there were no apprehended violence orders in place at the time of the attack. "We are aware of him, but he doesn't have an extensive history and we don't have any what we would call contemporary information in recent years," Mr McFadden said. "I don't believe (his criminal record) is extensive and, if it was, it was many years ago. "The details about the nature of the relationship, particularly in recent times, and the level of access that the 68-year-old had to his children is subject to investigation. "This was a planned activity on the part of the 68-year-old male and we are of the belief that shortly thereafter he has attended the address at Normanhurst and taken his own life." The father owned a number of firearms, including two powerful handguns legally registered in his name. "We understand that those handguns came into his possession lawfully earlier this year," Mr McFadden said. He said the victims were found dead by officers called to the "horrific scene" following reports of gunshots. "When you prepare yourself as a police officer, you prepare yourself to deal with themost tragic of circumstances, but nothing can prepare you to walk into a home and see two children in that state," he said. "Not just police, but the ambulance officers responding as well. So, there is no words that we can say to the family. It is only our diligence in the investigation for the coroner that would satisfy their interest. Speaking with many last night, they had a role to play last night and they did it admirably." He added that he couldn't "imagine the significant stress and heartache" the mother was going through. "It was a very harrowing experience for the emergency services who responded," he said. "You've got a family that is going to struggle to come to terms with it and emergency responders will struggle to come to terms with what they have seen." Detectives are now on scene at the family's home on Hull Rd, which remains a crime scene. It is understood the two teens' bodies were removed just before 6am. Forensic teams and homicide investigators had been searching the home all night for evidence, while the mother was recovering with friends after being treated for severe shock. The victims' mother, 36, was treated at the scene for severe shock. The murdered 15-year-old boy is understood to be a pupil at Pennant Hills High School. A spokesman for the school told news.com.au it had "no comment" on the death at this stage, as the victims are yet to be formally identified. However, staff at the school are understood to be holding a meeting this morning to deal with the news. Mr McFadden told news.com.au it had not yet been determined how many shots were fired but that police were speaking with several witnesses. He told reporters the attack was a "very harrowing experience for those initial responding emergency service providers". He said paramedics, who were visibly shaken by what they had seen, were comforted by a NSW Ambulance chaplain. "It is what can only be described as a tragic set of circumstances for the whole family," he said. "Two teenagers were unfortunately deceased in their bedroom and unfortunately at that time there was nothing we could do to help them," he said. The bloody attack took place in the house on Hull Rd, just off the Cumberland Highway. At the scene on Thursday evening, forensic investigators wearing white protective suits could be seen walking up and down the street with torches and cameras. About 150m of the road was blocked off, with witches hats stopping cars from entering one end, and uniformed police officers standing guard on both. Some residents who lived in the exclusion zone were escorted back inside their houses upon arriving late to the horror that, on this occasion, had come too close to home. Longtime resident John Howard, 82, told news.com.au it was "normally a pretty quiet street". Mr Howard said he didn't hear any gunshots. He was alerted to the incident when his daughter saw it on the news and contacted him before he came outside. A woman in her 30s arrievd home to find police at her home and her two teenage children shot dead. Picture: Dan Himbrechts. "I couldn't believe it," he said. "It's so horrific … especially for such young people to be the ones killed." About 20 residents, including young children, gathered on the street while police examined the crime scene. Homicide detectives continued doorknocking neighbours late into the night in search of information as to exactly what transpired. For now, all that is certain, is that two young people who were alive in their homes just hours ago - are now dead. 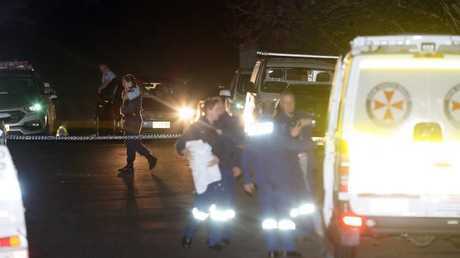 The double murder was just 5km from Carlingford, where a five-year-old was allegedly stabbed to death by his 36-year-old father last month. Police will address the media later today. EARLIER: POLICE believe the man responsible for the murder of two teenagers inside the bedroom of their Sydney home, has been found dead this morning. A NSW Police spokesman has this morning confirmed to the Daily Telegraph that the man - believed to be in his 50s - was found dead inside a home at Normanhurst. 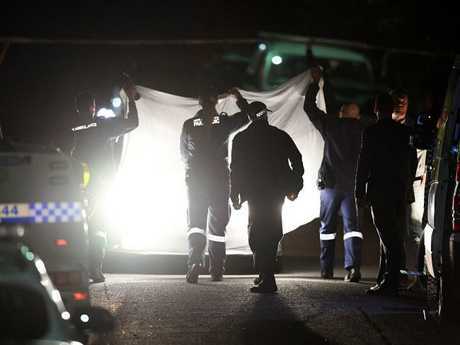 News.com.au has reported the man was the father of the children, a boy aged 15, and a girl aged 13, who were killed at their West Pennant Hills home in Sydney's northern suburbs. Forensic teams and homicide investigators have been combing the home all night for evidence, while their mother is recovering with friends after being treated for severe shock. Police were searching for the father of the teens as a "person of interest" after a woman returned to find a crime scene had been established at her house. Inside, in their bedroom, her son, 15, and daughter, 13, were dead. Police removed the bodies this morning at 6.30am. Emergency services have been at the scene of the horrific crime all night and a 150m exclusion zone is still in place around the home. EARLIER: A WOMAN arrived home to find her two children had been shot dead in their bedrooms in a suburban Sydney home, police have confirmed. 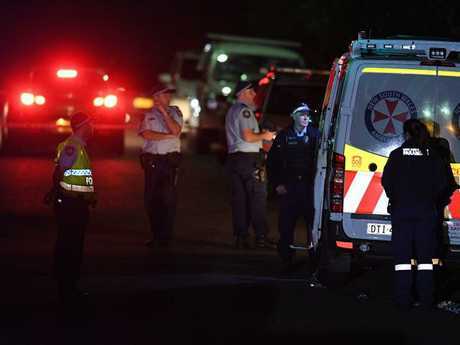 Police are now searching for a man in his 50s, after a boy, 15, and a girl, 13, were killed about 5.20pm at the house, in the northwestern Sydney suburb of West Pennant Hills. NSW Acting Assistant Commissioner Brett McFadden told reporters it appeared to be a "targeted incident" related to domestic violence. He said the victims were found dead by officers called to the "absolutely horrific scene" following reports of gunshots. The victims' mother, aged in her 30s, arrived at the scene after police and was treated for severe shock. Acting Assistant Commissioner McFadden told news.com.au it had not yet been determined how many shots were fired but that police were speaking with several witnesses. "At this stage, the person of interest we are looking for is still at large but we believe this to be a targeted incident and there are no risks to the community at this time," Acting Assistant Commissioner McFadden said. The fatal shooting occurred at around 5.20pm on Thursday. Picture: David Swift. The bloody attack took place in the house on Hull Road, just off the Cumberland Highway. About 150m of the road was blocked off, with witches hats stopping cars from entering one end, and uniformed police officers standing guard on both. About 20 residents, including young children, gathered on the street while police examined the crime scene. Homicide detectives continued doorknocking neighbours late into the night in search of information as to exactly what transpired. Two children are dead in a shooting in West Pennant Hills, 05-07-2018. Picture: TNV. For now, all that is certain, is that two young people who were alive in their homes just hours ago - are now dead.